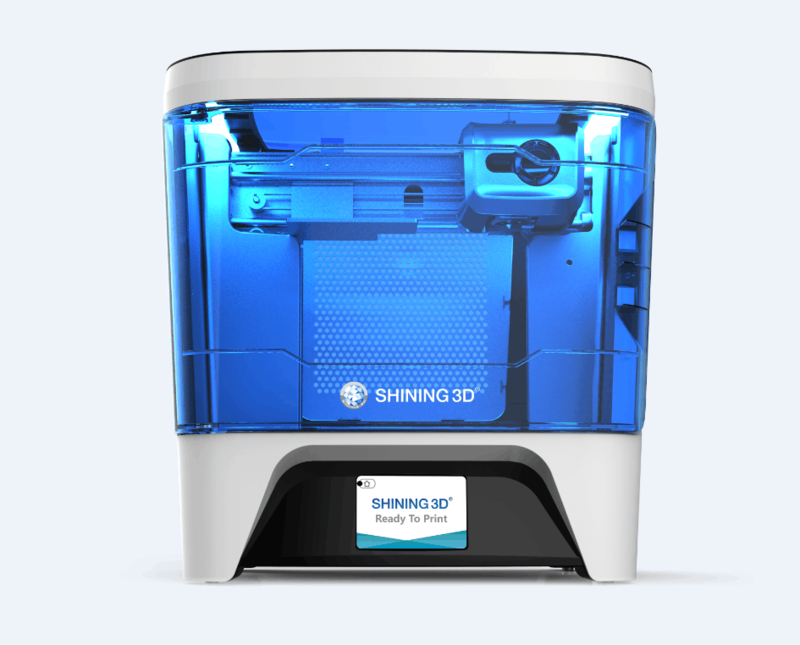 Shining 3D has released the Einstart-C FFF desktop 3D printer, adding to its existing series including the Einstart-S and the Einstart-L systems. The Einstart-C is Shining 3D’s solution for personal and company use, with added security features making ideal for 3D printing at schools and at home. The 3D printer has a build volume of 15.3cm cubed, and a layer resolution ranging from 0.1 to 0.4 mm. The filament is continuously deposited through a 0.4mm nozzle. To make the printer more accessible as a teaching tool suitable for children, the 3D printer features automatic levelling and is fully enclosed. Printing pauses when the enclosure door is opened, and resumes operation once closed again. A colour touch screen interface gives an improved simulation of the finished product. Front view of the Einstart-C printer. Photo via Shining3D. As a replication tool, the Einstart-C printer can be used together with Shining3D’s range of Einscan 3D scanners, which can create digital replicas of objects, such as sculptures, complex structures and tools, to be rendered as an STL file and 3D printed. Shining 3D’s own 3DStar software provides slicing capabilities. The sliced model can then be transferred via USB to the printer. While the printer does not print in multiple colours, the PLA material is suitable for acrylic painting and finishing. 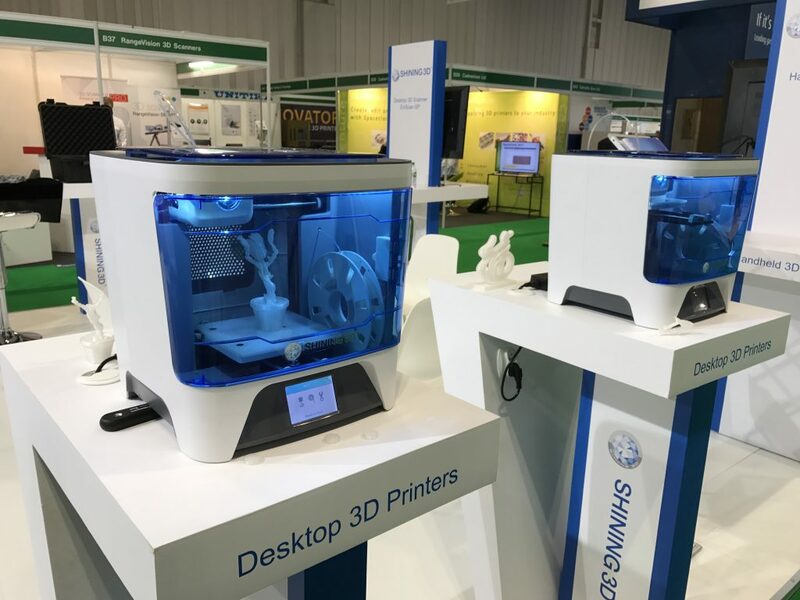 Following the opening of its Europe, Middle East and Asia headquarters in Stuttgart, Germany earlier this year, Shining 3D is expanding its customer base across the desktop 3D printing and handheld 3D scanner market. The company also produces a range of scanners for intra-oral and dental applications. Pricing quotes for the Einstart-C are available upon request directly from Shining 3D. Our featured image shows the Einstart-C printer on display at the TCT Show 2017. Photo via Beau Jackson. CDG have joined forces with 3D Systems at the International Jewellery Show IJL, Olympia, London from 3rd to 5th September 2017. Find us on stands J30 and J50 demonstrating the new ProJet 2500 wax 3D printer, design for creating wax patterns for casting jewellery. Also, we will be demonstrating the Geomagic Sculpt digital clay software for creating 3D models of jewellery and other items. Geomagic SCULPT software is the quickest way to create complex geometry. It is a modern and unique digital clay modelling software most suited to art and design including artefacts, toys, fashion and jewellery. The examples below give you a flavour for what Sculpt can do. Please contact CDG for for info. The ProJet 2500 multi-jet MJP printer from 3D Systems has won the 3D Printing Industry award for the Best Enterprise 3D Printer. - ProJet 2500 W for high-resolution wax parts / patterns, as used for investment casting in jewellery and for industrial applications. 3D Systems introduces the new ProJet MJP 5600 multi-material composite 3D printer: delivering new price performance standard for large format, multi-material 3D printing. PITTSBURGH, Pennsylvania, May 8, 2017 – 3D Systems at RAPID+TCT 2017 announced the new product. The new ProJet MJP 5600, offering print speeds up to two times faster, a larger build volume, and part costs that are up to 40 percent less than competing multi-material 3D printers. The ProJet MJP 5600 also features the new 3D Sprint™ 2.5 software, contributing to productivity by providing improved estimates of build time and material use. The ProJet MJP 5600 features best-in-class jetting technology to deliver high-definition parts used for prototyping, functional testing and medical modeling. The system’s multi-material capabilities enable customers to digitally blend rigid and elastomeric materials at the voxel level to achieve superior mechanical properties for a wide range of applications, including: assemblies, rubber-like components, jigs and fixtures, and dies. Coupled with 3D Sprint software, the ProJet MJP 5600 also allows customers to assign different material blends to separate shells within a single part.